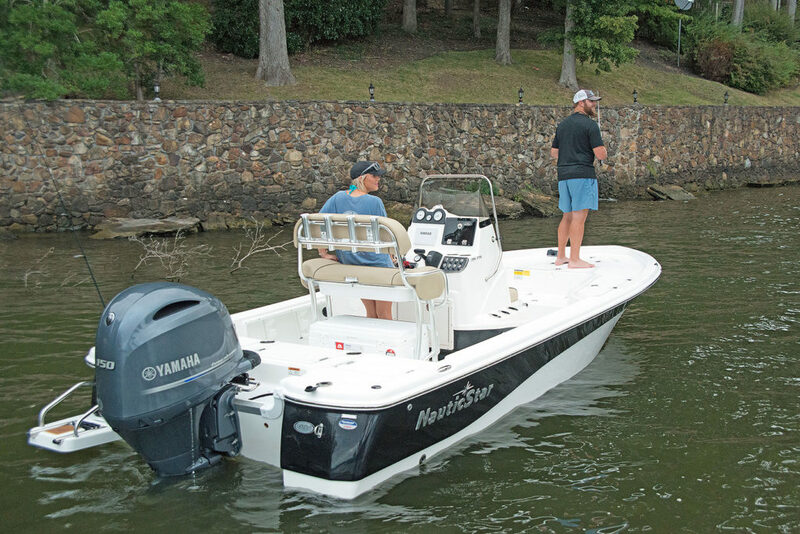 Bow fishing deck features dual rod lockers with organizers for 10 rods (5 each side) and gasket seals, a 30 gallon insulated fish box in the step-up, dry storage, 13 gallon in-console livewell/baitwell, and anchor locker with anchor. 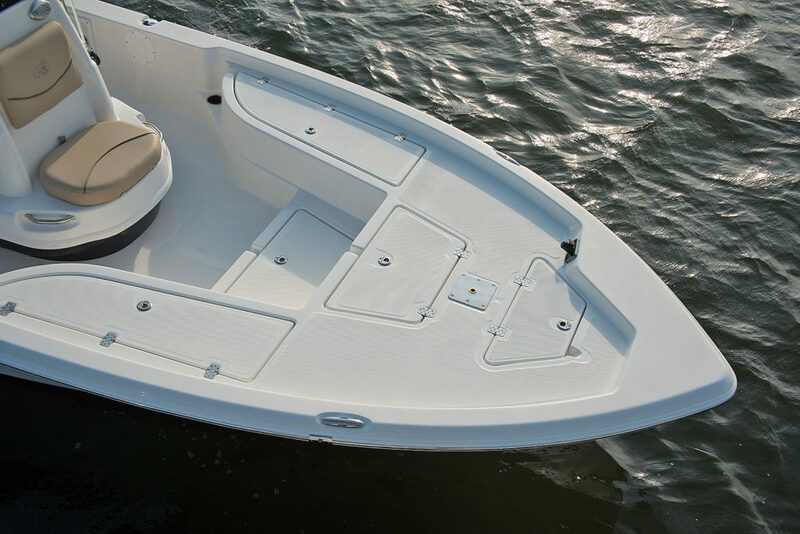 Each compartment has a new drain around each lid. 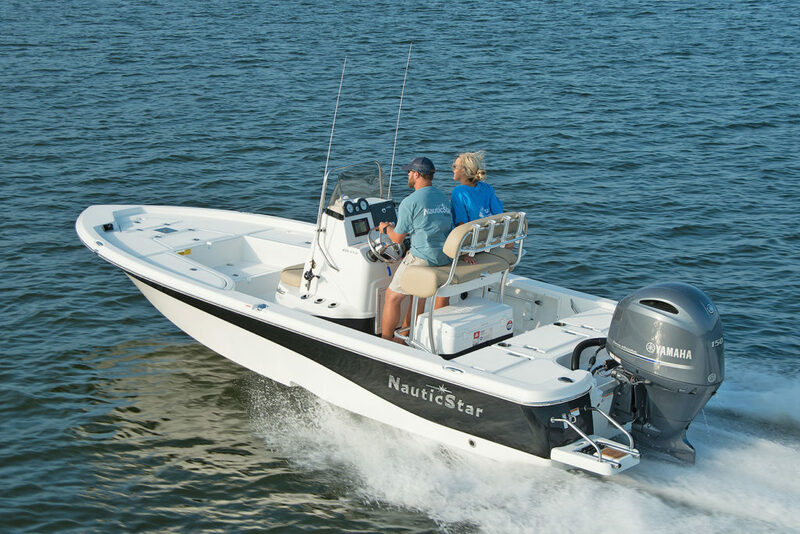 The elevated two-toned console has toe space for extra mobility, 6-vertical stainless steel rod holders, a removable curved windshield, black acrylic panel with matching glove box, 5-spoke stainless steel wheel with power knob, stainless steel toggle switches and and stainless steel fold-down grab rail. 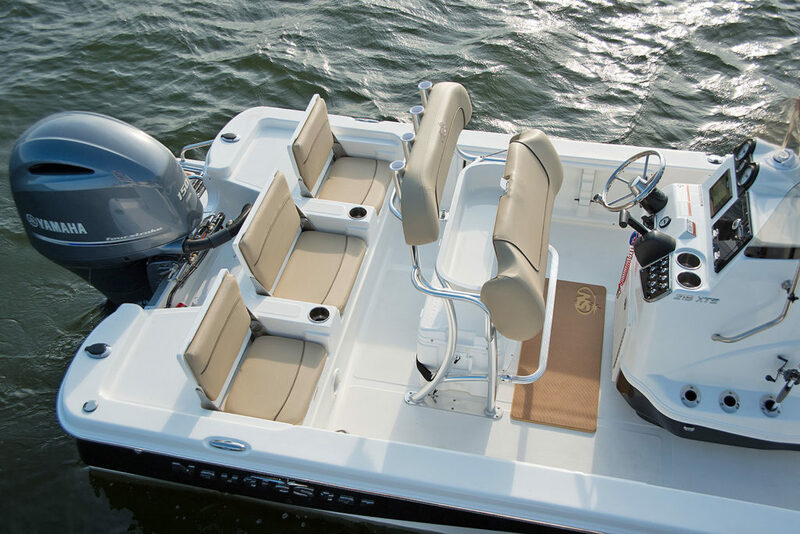 Aft there are 3-across jump seats that when in the down position form the fishing deck. 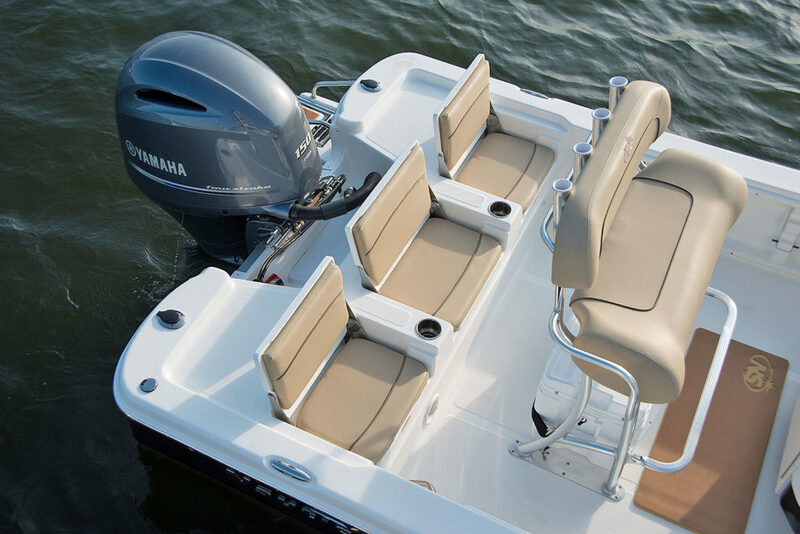 When up, they are comfortable passenger seating. 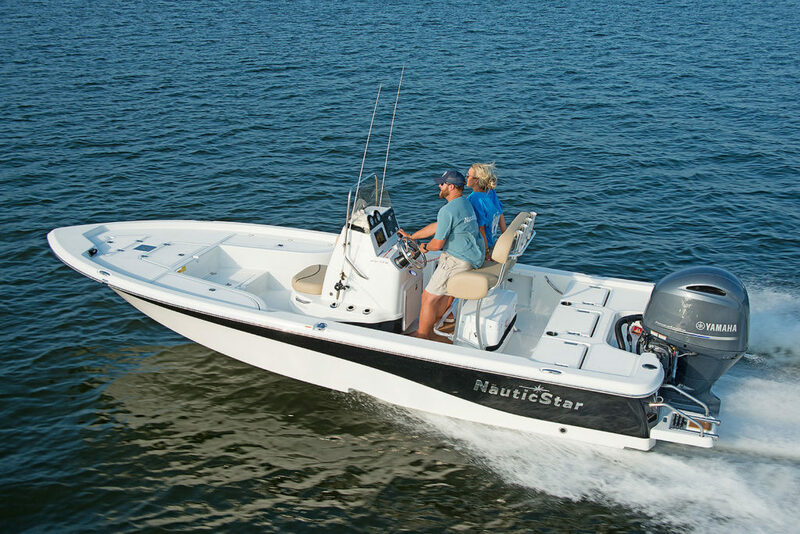 The starboard seat has tackle storage, the center compartment has a 27 gallon livewell, and port side seat has cast net/bucket storage. 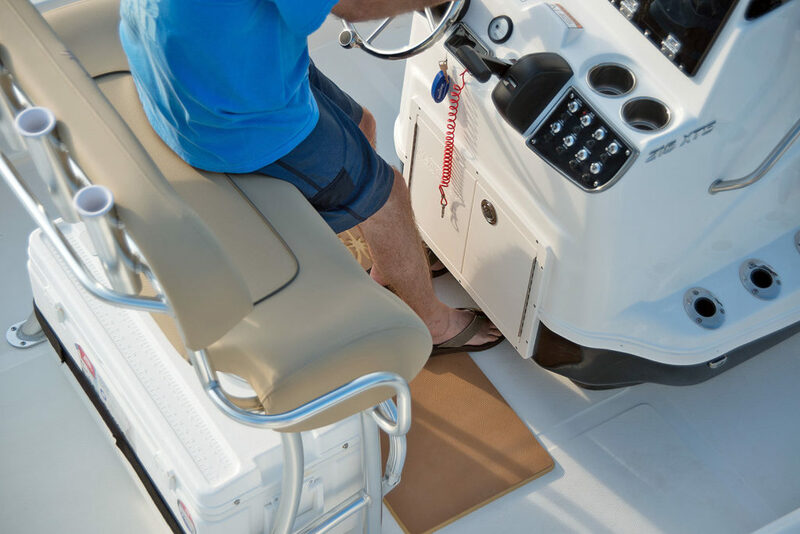 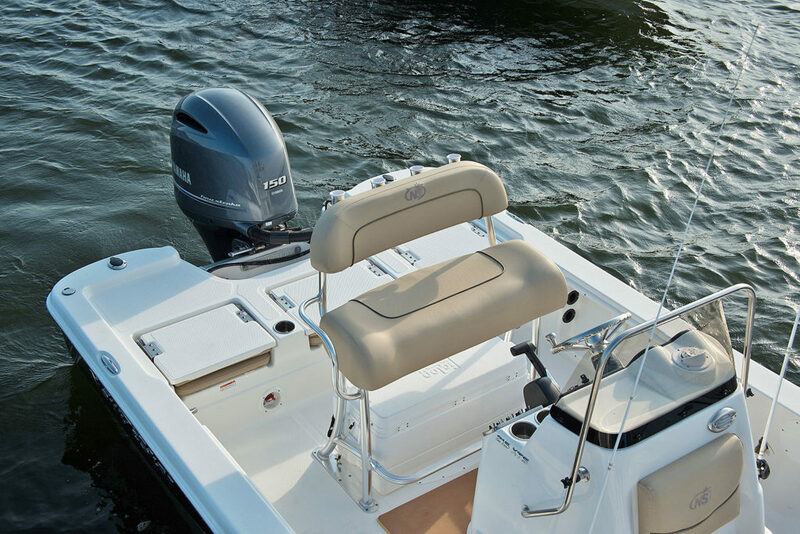 The front fishing deck has a stainless steel seat base for the optional pedestal fishing seat. 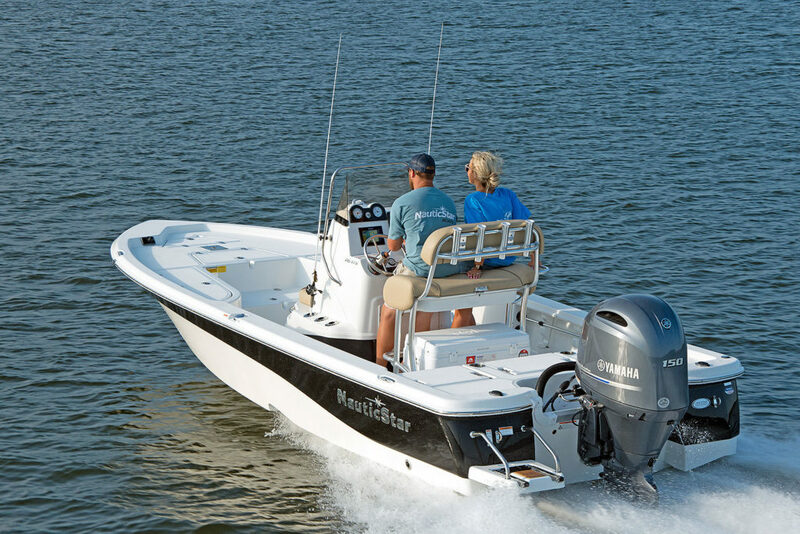 It is also equipped with a trolling motor harness. 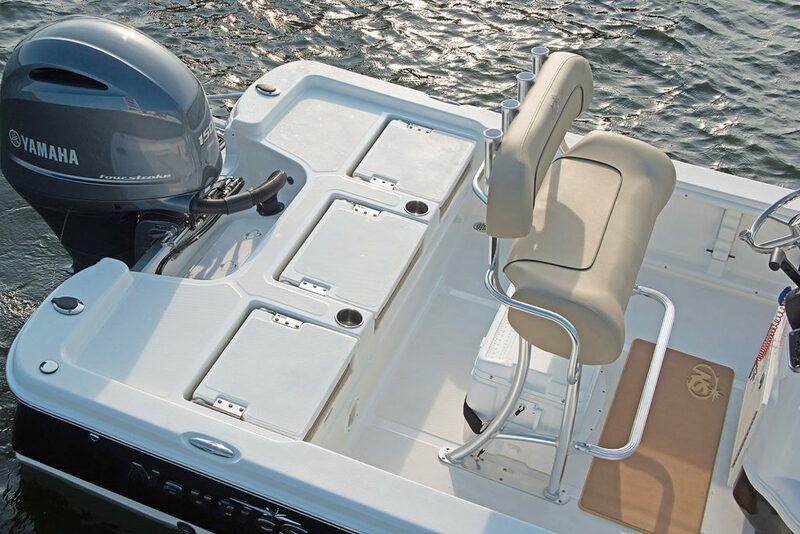 The console switch panel feature stainless steel toggle switches with integrated circuit breaker protection and lighted drink holders. 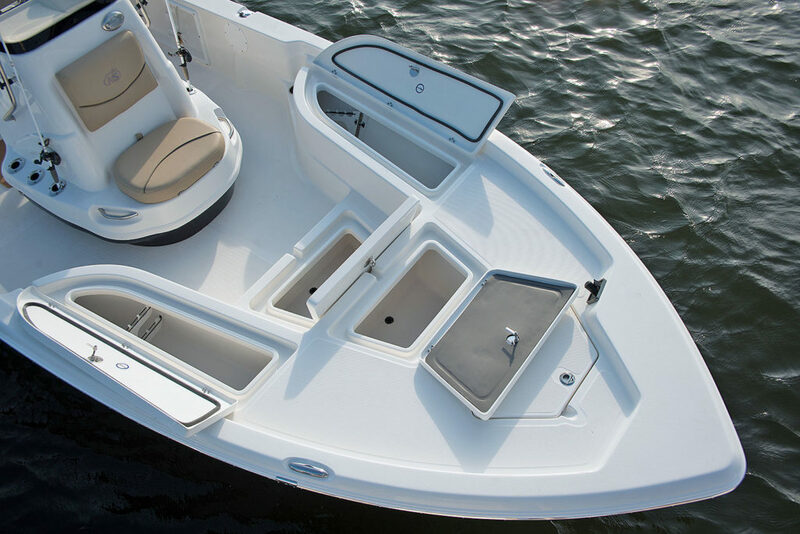 The 3-across seating backrest folds down to form the aft fishing deck. 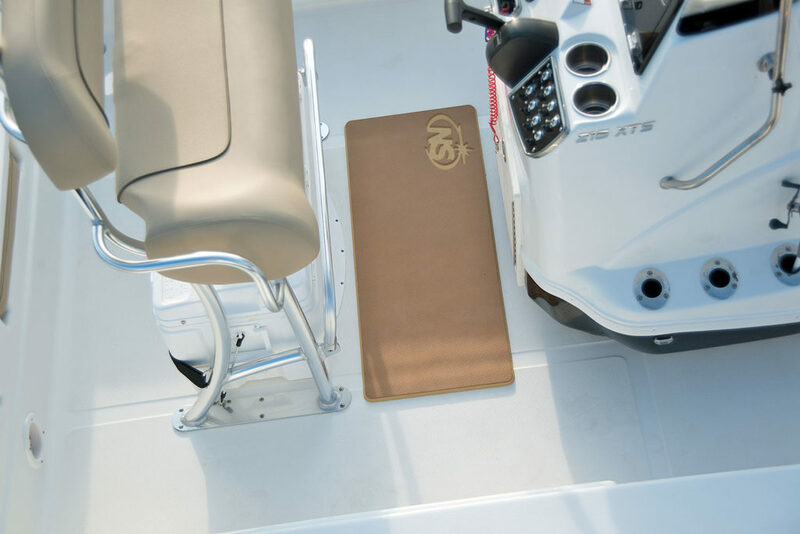 The new fishing seat option can be used on the bow or aft and folds down for travel. 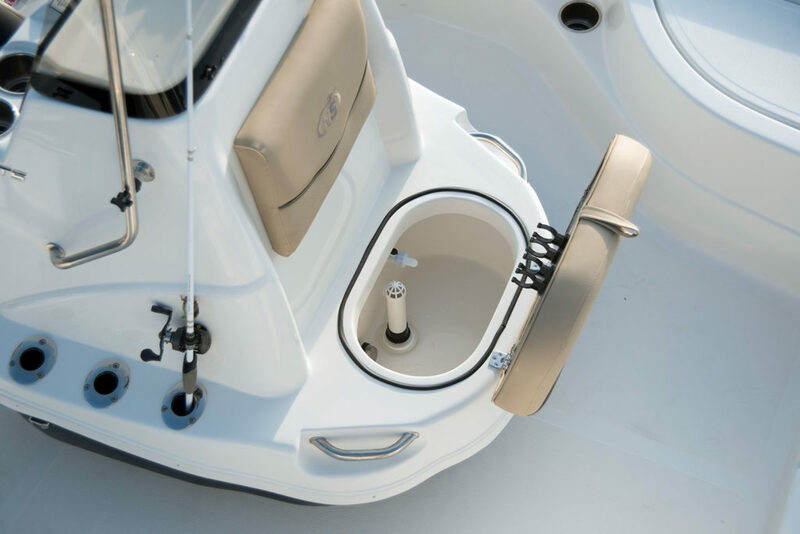 The fishing seat is ergonomically designed for comfort and maximum mobility. 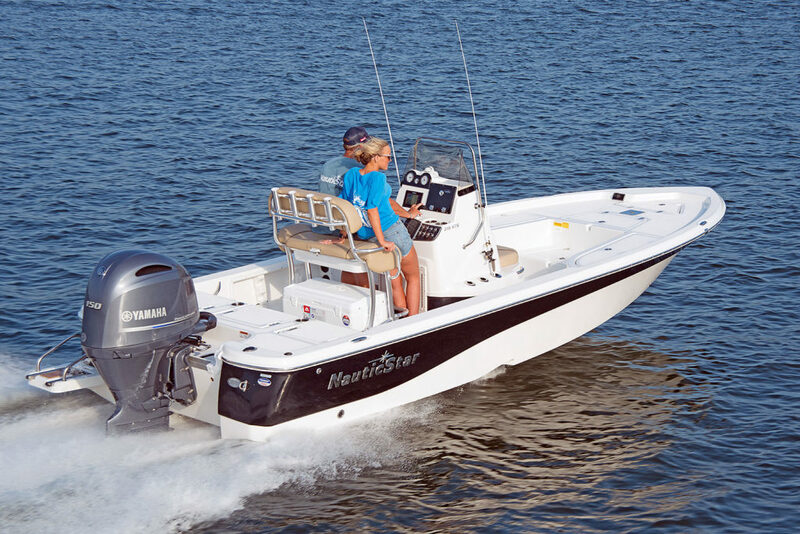 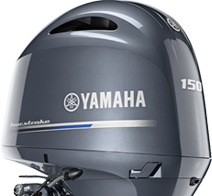 The Shallow Bay version of the 215 XTS features a shallow water tunnel for skinny water fishing.